* Soccer teams will need to bring two (2) ball boys for the Friday and Saturday matches to help keep the competition moving. Colonial will provide ball boys for the Tuesday matches. The higher seed will be considered the home team in each match. 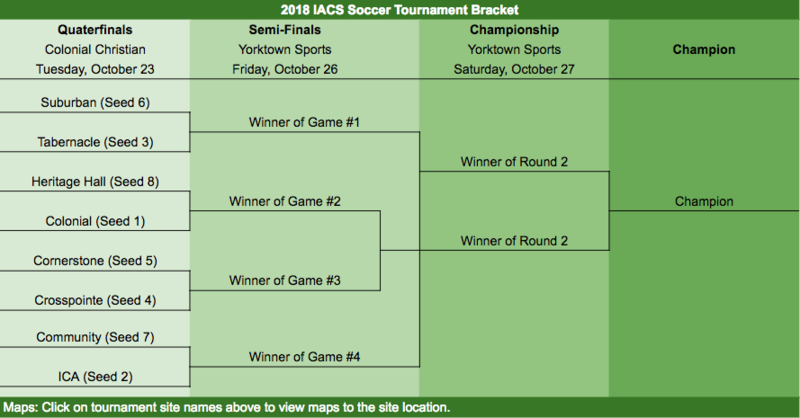 ** The 2018 IACS Soccer Quarterfinals on Tuesday, October 23 are being hosted by Colonial Christian School at 8140 Union Chapel Road, Indianapolis, IN. If you can't make it, watch it at the LiveStream here.